Trees are an ancient symbol for enduring love and stability. 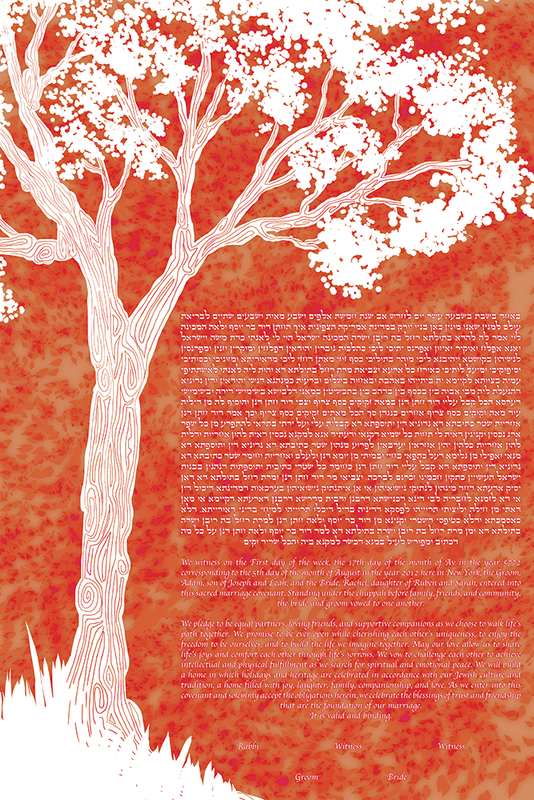 This ketubah embodies these values by the presence of a large and blossoming tree. The white tree takes center stage in the minimal ketubah representing light, goodness, innocence, and purity. The colour of perfection contrasts against a vibrant patterned background in two options – red and electric blue. The ketubah’s text is shaded under the leaves of the thriving branches in the colour of perfection. This ketubah is perfect for people who draw strength from their relationship; a kind of strength that only grows stronger with time. These couples have roots embedded deep into the foundation of their relationship. The blooming white tree symbolizes the new beginning of a relationship after the signing of the ketubah. The Red Cutout Tree Ketubah is part of our A Cutout Tree Series of Ketubah. Please see the series page to see the same ketubah in different colours.